With my lovely foodie friend Sarah from Fritos and Foie Gras and a few of our favorite hungry gal pals, I indulged in a life changing meal at Cowgirl - a Frito® Pie. Yes, you heard me right. This “Texas tradition” is a heaping pile of beef brisket or veggie chili (your choice, but I obviously went with the meaty option), melted cheddar, onions, sour cream and jalapeños bursting out of a bag of Fritos®. When looking at this glorious mess, one will either be immediately starving or grossed out. 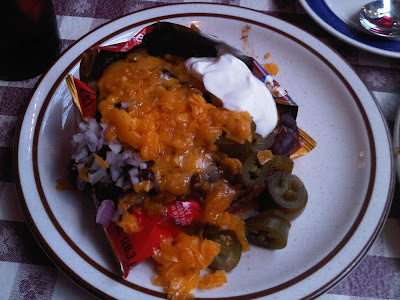 I couldn't wait to dive into the piping hot chili, gooey cheese, tender beef, and crispy corn chips. The jalapeños added a mild spice; while the creamy and smooth sour cream perfectly balanced all of the flavors without being overwhelming or drowning anything out. This may not be a diet-friendly dish, but it is worth the cheat. And who didn’t love crunching on Fritos® as a kid while watching TGIF? This kitschy, Texan-themed restaurant is perfect for an early dinner with the kids you’re babysitting or for West Village locals to grab a drink or two with a heavy dinner to prevent a hangover. The prices are reasonable, the service is prompt and friendly, and the comfort food is delicious. Stop by Cowgirl soon after work to catch up with your girlfriends, while straying from your daily carb counting woes. I havent been to cowgirl in about... 5 years! crazy! 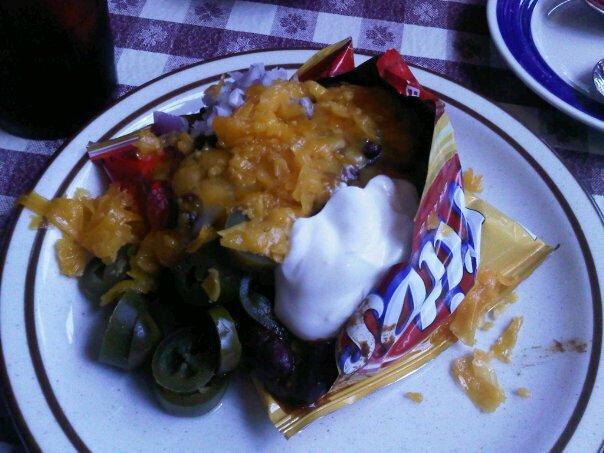 i have never had the frito pie but hot damn that looks good !